The Photography Services Agreement is used for providing general photography and printing services to your customers. time, I typically modify to my own needs, add logo and print for EULA and eager to try others." This Photography Services Contract is included in editable Word format that can be customized in Word or by using the included Wizard software. How do you write a Photography Services Contract document? 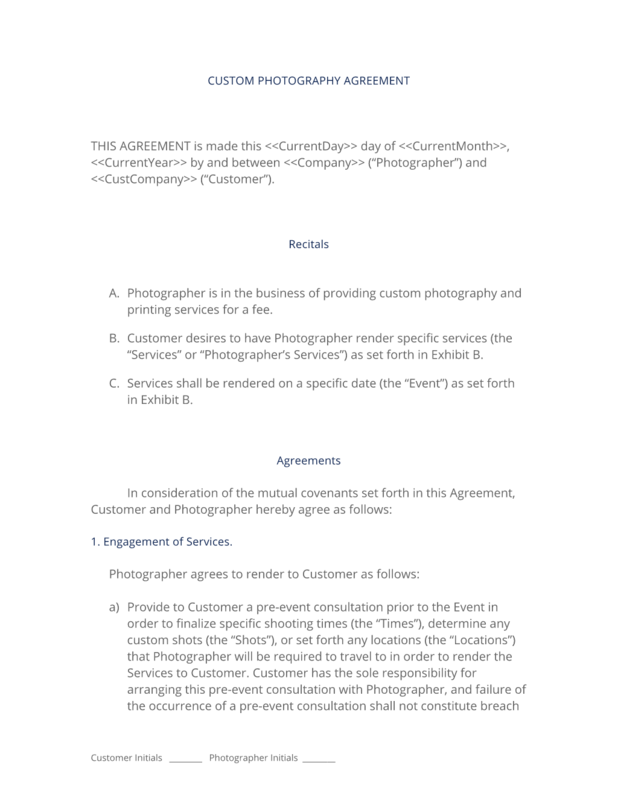 THIS AGREEMENT is made this Current Day day of Current Month, Current Year by and between Company Name ("Photographer") and Company Name ("Customer"). Photographer is in the business of providing custom photography and printing services for a fee. Customer desires to have Photographer render specific services (the "Services" or "Photographer's Services") as set forth in Exhibit B. Services shall be rendered on a specific date (the "Event") as set forth in Exhibit B. Provide to Customer a pre-event consultation prior to the Event in order to finalize specific shooting times (the "Times"), determine any custom shots (the "Shots"), or set forth any locations (the "Locations") that Photographer will be required to travel to in order to render the Services to Customer. Customer has the sole responsibility for arranging this pre-event consultation with Photographer, and failure of the occurrence of a pre-event consultation shall not constitute breach of this Agreement. Provide the agreed Services on the dates, Times, and Locations as agreed upon in the Specifications, and provide images taken during the Event (the "Proofs") to Customer as soon as they are available. Provide proof of agreed-upon expenses associated with the Event and the execution of Photographer's Services and present them to Customer for approval. Provide to Customer a post-event consultation in order to review all images taken during the Event, or otherwise arrange for the insured delivery of any images or other related materials. Provide other such services as Customer may request from time to time, such as additional Shots, assistance to Customer's staff and employees or additional project consulting. Provide to the Customer ordering and photographic reproduction services. Photographer will use reasonable diligence in the development of the Proofs and endeavor to deliver to Customer all agreed upon Specifications outlined in Exhibit B no later than Delivery Date. Customer acknowledges, however, that this delivery deadline listed in Exhibit A, is an estimate, and is not a required delivery date. Photographer will retain all rights to any and all photographic materials, custom Shots, proofs, or other intellectual property for the entire project and will provide the Customer with the output formats only. Customer shall retain all of Customer's intellectual property rights in any logos, graphics, text, images, or other components owned and transmitted to Photographer for use in fulfillment or creation of Services. Photographer shall retain, under the fullest extent under the law, any and all film, digital files, proofs, samples, prints, or negatives created or produced for Customer pursuant to this Agreement. Customer agrees to return to Photographer any materials Customer may have of Photographer's such as artwork, mock-ups, comps, text, digital media, film, images, or any other physical or digital embodiment of Photographer's creative work performed under this Agreement. Upon termination or expiration of this Agreement, Customer agrees to be solely responsible for any additional use of materials and advertisements created by Photographer pursuant to this Agreement. Additional expenses may include, but are not limited to: Fees, Licenses, Translations, Royalties, Talent, and other associated fees. Photographer's obligation in 4.a shall not apply in any respect to foreign use. For all of Photographer's Services under this Agreement, Customer shall compensate Photographer in cash, pursuant to the terms of Exhibit A attached hereto. In the event Customer fails to make any of the payments referenced in Exhibit A by the deadline set forth in Exhibit A, Photographer has the right, but is not obligated, to pursue any or all of the following remedies: (1) terminate the Agreement, (2) withhold all materials, Services, and content, (3) bring legal action. Customer agrees to indemnify and hold Photographer harmless with respect to any claims, loss, lawsuit, liability, or judgment suffered by Customer which results from the use of any material prepared by Photographer or execution of Service by Photographer or at the direction of Photographer, which has been materially changed from the Specifications. Photographer agrees to make available any items, hardware, or software as Customer and Photographer may agree are reasonably necessary for such purpose. Specific items, hardware or software requirements are listed on Exhibit B attached hereafter. This Agreement shall be binding upon and inure to the benefit of Customer and Photographer and their respective successors and assigns, provided that Photographer may not assign any of his obligations under this Agreement without Customer's prior written consent. Customer warrants that everything Customer gives Photographer to use in fulfillment of Services is legally owned by or licensed to Customer. Customer agrees to indemnify and hold Photographer harmless from any and all claims brought by any third party relating to any aspect of the Services, creative or other content, including, but without limitation, any claims resulting from missed Shots, missed Times, inaccessibility to Locations, weather related problems, inaccessibility or lack of cooperation from critical employees, staff, or other personnel required by Photographer in order to meet any of the deliverables or obligations listed in Exhibit B; difficulty in gaining any access to the agreed upon Locations or any demands, liabilities, losses, costs, and claims, including attorney's fees, arising out of injury caused by Customer's products/services, material supplied by Customer, copyright infringement, and defective products sold via the advertising or Services. Further, Customer agrees to indemnify Photographer from responsibility for problems/disruptions caused by third-party services and contractors that Customer may use such as reproduction services, enlargements, digital processors, transportation, shipping or hosting services, film processing, and other services that relate to the execution of the Services outlined in this Agreement by Photographer. The complete Photography Services Contract - with the actual formatting and layout - is available in this Contract Pack.